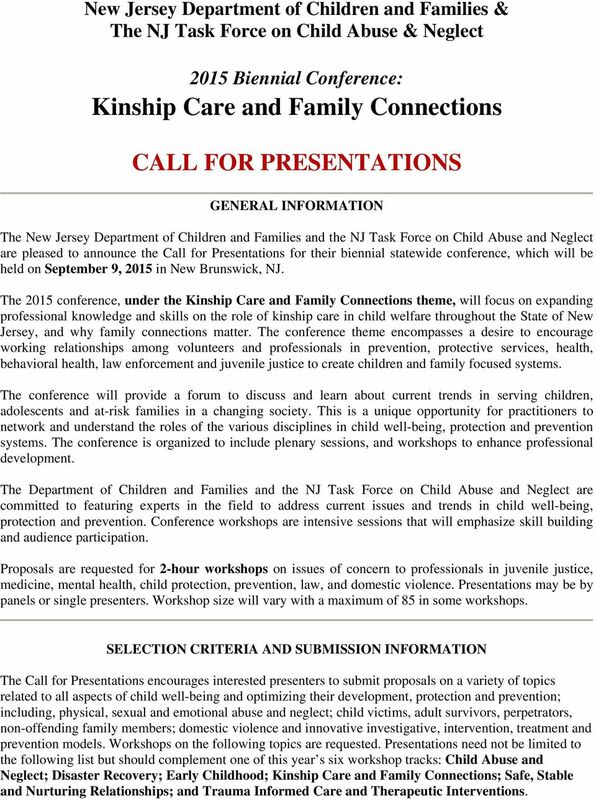 Download "Kinship Care and Family Connections"
1 New Jersey Department of Children and Families & The NJ Task Force on Child Abuse & Neglect 2015 Biennial Conference: Kinship Care and Family Connections CALL FOR PRESENTATIONS GENERAL INFORMATION The New Jersey Department of Children and Families and the NJ Task Force on Child Abuse and Neglect are pleased to announce the Call for Presentations for their biennial statewide conference, which will be held on September 9, 2015 in New Brunswick, NJ. 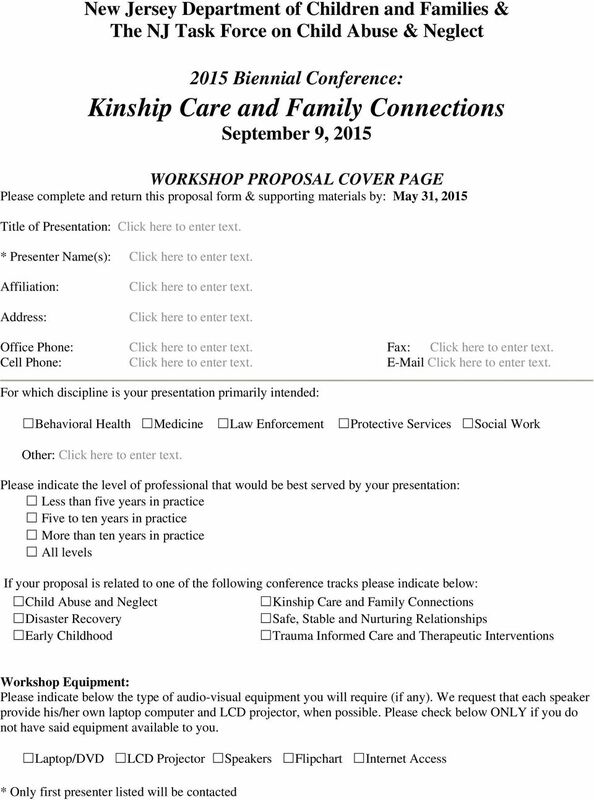 The 2015 conference, under the Kinship Care and Family Connections theme, will focus on expanding professional knowledge and skills on the role of kinship care in child welfare throughout the State of New Jersey, and why family connections matter. The conference theme encompasses a desire to encourage working relationships among volunteers and professionals in prevention, protective services, health, behavioral health, law enforcement and juvenile justice to create children and family focused systems. The conference will provide a forum to discuss and learn about current trends in serving children, adolescents and at-risk families in a changing society. This is a unique opportunity for practitioners to network and understand the roles of the various disciplines in child well-being, protection and prevention systems. The conference is organized to include plenary sessions, and workshops to enhance professional development. 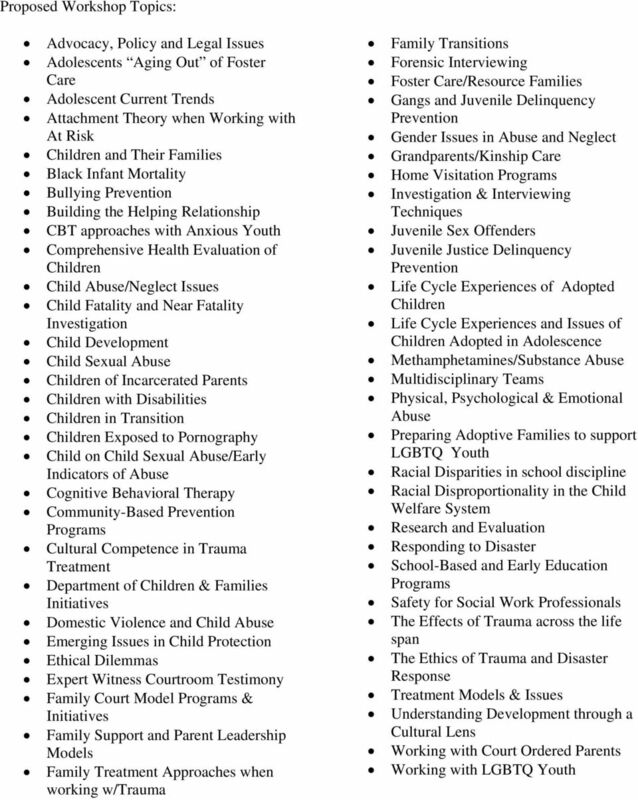 The Department of Children and Families and the NJ Task Force on Child Abuse and Neglect are committed to featuring experts in the field to address current issues and trends in child well-being, protection and prevention. Conference workshops are intensive sessions that will emphasize skill building and audience participation. Proposals are requested for 2-hour workshops on issues of concern to professionals in juvenile justice, medicine, mental health, child protection, prevention, law, and domestic violence. Presentations may be by panels or single presenters. Workshop size will vary with a maximum of 85 in some workshops. SELECTION CRITERIA AND SUBMISSION INFORMATION The Call for Presentations encourages interested presenters to submit proposals on a variety of topics related to all aspects of child well-being and optimizing their development, protection and prevention; including, physical, sexual and emotional abuse and neglect; child victims, adult survivors, perpetrators, non-offending family members; domestic violence and innovative investigative, intervention, treatment and prevention models. Workshops on the following topics are requested. Presentations need not be limited to the following list but should complement one of this year s six workshop tracks: Child Abuse and Neglect; Disaster Recovery; Early Childhood; Kinship Care and Family Connections; Safe, Stable and Nurturing Relationships; and Trauma Informed Care and Therapeutic Interventions. 3 Incomplete proposals will be returned with an opportunity for resubmission. 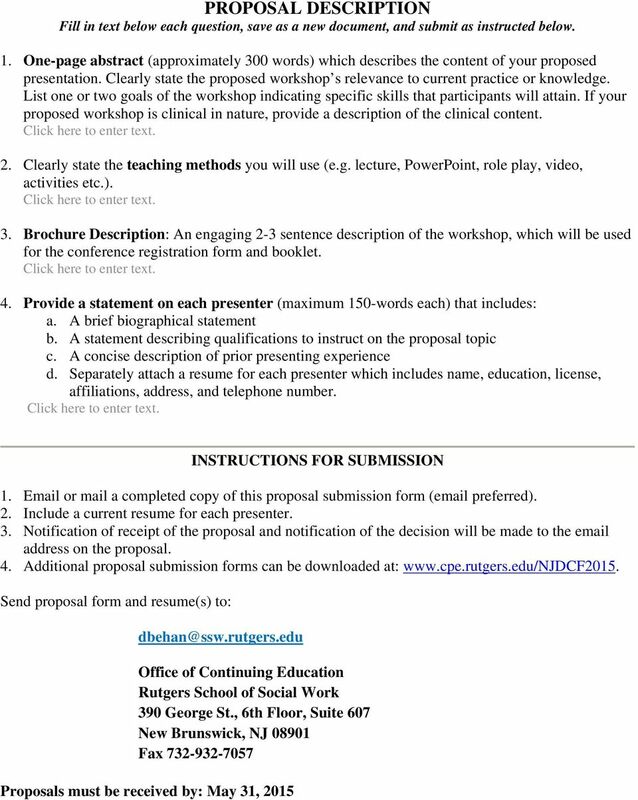 Communication will be directed to the presenter designated on the Proposal Cover Page. The Conference is unable to provide honoraria, free conference registration or travel expense reimbursement for any presenter submitting a proposal. To download the Call for Presentations form or for more information please visit the conference website at: CRITERIA FOR PRESENTERS 1. Five years of experience in the particular area of instruction; 2. A graduate degree in the particular area; and, 3. Certified or licensed (unless exempt) to practice in the content area in which presenting (i.e. social work, psychology, psychiatry, marriage and family therapy, alcohol and drug counseling, counseling, medicine or law) or be a faculty member of an undergraduate or graduate college or university. Proposals must be received by: May 31, 2015 Notification of whether or not your proposal has been selected will be mailed by June 30, 2015. CURRICULM VITAE. Michelle D. Evans-Chase, PhD 1131 Simpson Avenue, 2 nd fl. Ocean City, NJ 08226 PH (609) 602-3792 email: evans-chase@rowan. Violence Prevention in Young Families Track Are you a current graduate student with a desire to develop your knowledge and skills in violence prevention among young families, among youth, and towards women? CURRICULUM VITAE Jason S. Fleming, Psy.D. Licensed Psychologist Associates in Psychological Services, P.A. 25 North Doughty Avenue Somerville, New Jersey 08876 (908) 526-1177 ext. 56 EDUCATION: Psy.D. CURRICULUM VITAE. Psy.D. Graduate School of Applied and Professional Psychology, Rutgers University, 2004. Published Dissertation: "Evaluating the Effectiveness of Domestic Violence Treatment in Washington State". Sue R. (Chartered Clinical & Forensic Psychologist) B.Sc. (Hons. ), M.Sc., D. Clin. Psychol. AFBPSs.